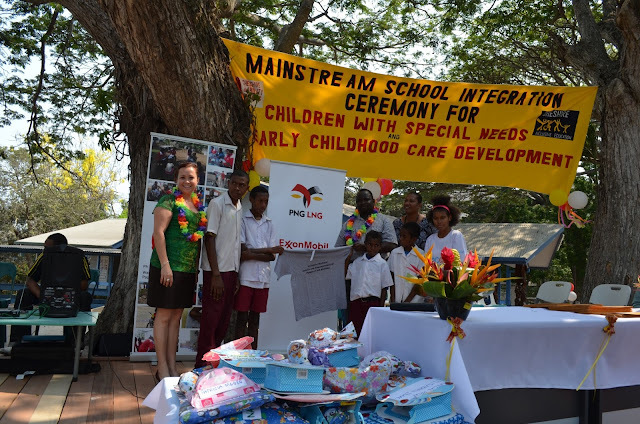 EMPNG Public & Government Affairs Operations Manager Nora Scheller (left) presenting the t’ shirts to General Manager of the Cheshire Disability Services PNG, Bernard Ayieko with some of the children with special needs and early childhood care development on hand to receive them. Photo supplied. ExxonMobil PNG, operator of the PNG LNG project, recently supported the Cheshire Disability Services Papua New Guinea in Hohola, Port Moresby, with funding to help celebrate the International Day of Persons with Disabilities. The commemoration of the day aims to promote an understanding of disability issues and to mobilise support for the dignity, rights and well-being of persons with disabilities. Cheshire Disability Services Papua New Guinea is a non-governmental and development organization that provides a variety of rehabilitation services for people with disabilities in PNG. One of its services is inclusive education and early childhood development. This year’s International Day of Persons with Disabilities celebration was extra special for Cheshire Disability Services because it included the integration ceremony for children with special needs and early childhood care development who completed the inclusive education and early childhood development program and will be going into mainstream schools in 2016. One hundred and forty special needs students successfully completed the program and will be moving into mainstream schools next year. ExxonMobil PNG’s public and government affairs operations manager, Nora Scheller said ExxonMobil was proud to be part of the celebration and commended Cheshire Disability Services for their work in making a positive difference in the lives of people with disabilities. About 60 staff and field workers, 200 parents and 200 people living with disabilities gathered to celebrate the day and witness the integration ceremony. Funding from ExxonMobil PNG was used to purchase 500 t’shirts for the event. This year’s theme for the celebration was, “2015 International Day of Persons with Disabilities, Inclusion Matters: Access and Empowerment of People of All Abilities”.